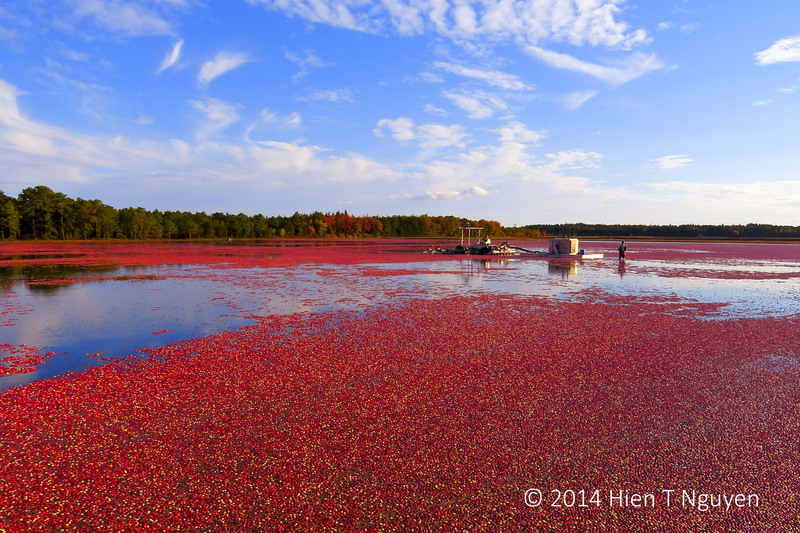 My submission for this challenge is a photo of a cranberry bog near Chatsworth, NJ where Herb Armstrong, a foreman for the Lee Brothers corporation, had just finished using his harvesting machine to release cranberries and have them float on the water, ready for corralling and pumping into trucks the following day. Herb is 64 years old this year and has worked in cranberry farming for 34 years, doing every possible job in that field. As I watched him one Sunday afternoon a few weeks ago, he was the sole machine operator for miles around. He went back and forth across the bog with his machine, stopping now and then to remove vines entangled in the harvester’s claws. At 5 PM, he climbed off and walked away. I thought he was done for the day and was going to go home. Instead, he went to look at other cranberry fields nearby to see what needed to be done the following day. A belated thank you for visiting and commenting on this page! I bet most people don’t think about this when they pop open that can of cranberry sauce on Thanksgiving or Christmas day. I love the photo. You are right of course. Happy Thanksgiving! What a beautiful photo. I love the red of those cranberries! Beautiful photo! It is perfect for the challenge! Blue sky, white cloud and red cranberry…beautiful shot! I lived in NJ for ten years and never got to see cranberries being harvested. It looks fantastic! You will have to come back next year for the cranberry season, generally in October. Now that’s commitment! Great shot. Thank you for the story, Hien! It takes so much daily diligent work, and we take granted. He is so diligent, working as hard on a Sunday as any other day. Indeed. Thank you for stopping by this blog.